A registrar in his natural habitat: caring for collections. Thanks to Matt Leininger for the picture. I was thinking again and again about these words. Alana works on an island, so her words hold especially true for her position, but I found it a brilliant description of our jobs as registrars, collection managers or curators of collections in general. Fortunately, the lone wolves that have to roam their territory all by themselves with no one within reach are not the majority. But, to stay in the picture, registrars don’t form packs. The registrar’s work has to be done alone by 71%. Registrars often work concentrated behind the scenes. Thanks to Lisa Verwys for the picture. No-one will deny that it is great to be alone in the storage area from time to time. Working alone as a registrar has an amount of freedom few people can afford nowadays. Depending on the architecture and infrastructure of the storage it might even mean no internet and mobile connection. Separated from the rest of the world, on a lonesome island. What are the consequences? Well, there are certain dangers. Firstly, the pure, physical ones. There has to be a security concept for the one that works all alone. Generally, the one who is forced to work alone should always have the possibility to call for help and assistance. It should be made sure that it is recognized when he or she gets in a situation where he or she is not able to call for help. Possible ways: A routine in calling him or her by phone to check if everything is alright. A mobile phone that he or she always carries with her / him (given there is mobile-phone reception). A checkup procedure that makes sure he or she doesn’t get locked in a storage area. Extra inspection tours of the security guard. All of this should be organized before someone starts working alone. But there are other, less obvious dangers in working alone. Chances are high no one thinks about the one that works in the storage area when all go out for lunch. Important information in institutions is often passed on over a cup of coffee during a break. People who don’t get feedback or have the possibility to exchange with their colleagues tend to become solitary. It’s the task of the registrar him/herself to avoid total isolation by taking part in the community of the museum. But it’s also the task of his/her colleagues not to forget the one in the storage area. And last but not least it’s the job of the ones that are responsible for the working organization in the museum to create possibilities of exchange between the staff members. This might be the only way that the registrar becomes not the „strange animal from the storage“ but stays the colleague. Okay, make it „the colleague with the strange job“, but still: the colleague. 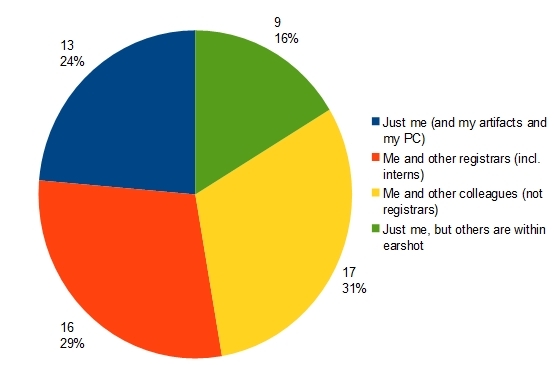 The numbers show why many registrars feel isolated, even within a team. This has much to do with the job the registrar has to perform. He or she has to care for the well-being of the objects in the collection. That includes often saying „no“ when it comes to loans or events within the museum. If the head of the institution wants to have a big party in the galleries, the registrar has to stand his or her ground by saying that this can’t include food and drinks. If the marketing team wants to collect school groups with a historic school bus, the registrar most certainly has to say that this isn’t possible. If a befriended institution wants to borrow a flag and plans to hang it in the entrance of the exhibition without protection, he or she can only shake her head. He or she acts as an attorney for the artifacts, who can’t speak for themselves. Although on paper all staff members are responsible for preserving objects for the future, the buck often stops at the desk of the registrar. But the registrar is not the head of the institution. Usually, he or she is not even the head of the department. This means although the responsibility lies on his or her desk, his or her decision may not be the final one. This adds up to the feeling of being isolated. For the team members, it is the other way round. Curators have great ideas for upcoming exhibitions. Designers have new ideas how to present the artifacts. Marketing people think intensely on how to attract visitors. And then the registrar comes and just says „no“ to their ideas. Of course, for them it looks like the registrars are strange animals! They are the ones that spoil all the fun! But the painful truth is: that’s the job. 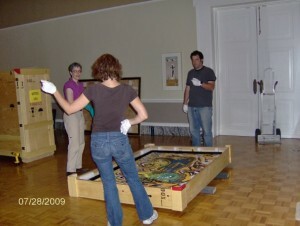 If the registrar is lucky, there are also conservators on the team that back up his or her opinion. Otherwise he or she can just point to policies and standards (which is rather boring for the rest of the team) or present cases where it went wrong because nobody listened to the registrar (which is more entertaining, but not necessarily more convincing). In the end, the registrar can’t do more than state his opinion and document the whole process of decision-making to be on safe ground. High-quality work is important – and needs enough time and money. Thanks to Sharon Steckline for the picture. So, is the registrar an endangered species? Well, the registrar might not be more endangered than any other museum professionals today. When money is tight, cultural institutions are the first that are looked upon with a frown by authorities. But as far as I can see, this is not limited to collection management. Politicians tend to ask if a certain museum can be run by fewer people or is necessary at all. In fact, many institutions in countries outside the US just recently realized what registrars are good for and create more jobs in this field. But that’s just one part of the story. Another part is that quality of our work is really in danger. When money is tight, decisions on where the money should go are hard to make. And often, the squeaky wheel gets the grease. Registrars, trained to act as inconspicuous as possible by trade, often are the ones that are not heard in their requests for archival materials and manpower. But again, that’s just one part of the story. In many smaller museums money is so tight that it’s not the decision between archival boxes for collection management or advertising in the newspaper, it’s the decision between fixing the roof or having an exhibition. In this cases human resources are a big issue3. Here, the position might be called „registrar“ but it comprises much more. He or she might be also the visitor guide, complaint manager, shop assistant, cashier and curator all in one person. This often means that this person can’t invest as much time in collection management as is needed. Other museums decide they can’t afford a registrar on permanent staff. They will hire freelance registrars when urgently needed. 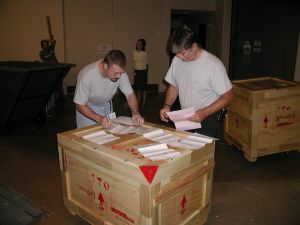 This is a good idea when it comes to planning new storage units, get consulting on how registration should be organized, have the artifacts of a temporary exhibition in safe hands4 or do an inventory on a certain collection. 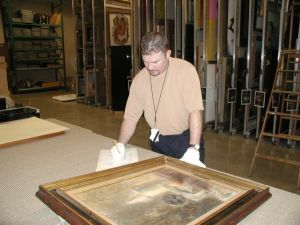 However, if an institution holds a collection that exceeds a certain amount of objects (not easy to draw a line here, this depends as well on the scope of the collection as on how it is „used“ by the institution), collection management is a full-time job. The idea to let a registrar do an inventory on the collection and then have „someone do it along his regular duties“ or „all the staff cares for the collection“ doesn’t work. Quality in museum work is always a combined effort. Teamwork is the key. Thanks to Matt Leininger for the picture. A registrar is more than a human data base. If you have all collection items absolutely accurate in your data base (name a museum that has! ), this doesn’t mean it stays that way. Keeping track of the objects is a permanent effort. Having everything correct in the data base, too. You can have all staff members swearing an oath to always document every movement of objects in the data base, you will still have St. Entropy messing around in your storage area! A good registrar will have an eye on that. But there’s more to it. Like in every library, some objects get „lost“ by being put in the wrong storage place. A registrar that is familiar with his / her collection will have an idea where to search for it – based on his experience and on the knowledge who handled the object recently. Don’t forget you usually not only contract a registrar – you contract an elephant’s brain! Lastly, a registrar who is in charge of a collection for a long time will somehow merge with his or her collection and storage area. He or she develops something like a sixth sense for things that are wrong: an unusual increase in humidity before someone checked the hygrometer, an object that just doesn’t look the way it always looked, a voice telling the registrar to take a walk around the outside storage hall once again before leaving… That’s something that develops over time. You can’t have it with short-term contracts for only a few months or a year. As an individual: all who work in the museum have to take care that the registrar is safe during his time working alone and doesn’t become isolated from the rest of the museum community. As a professional: all the colleagues need to understand what is the job of the registrar. It’s not that he or she wants to spoil the fun, it’s his or her job to protect the objects so others can enjoy them in the future, too. As a museum: authorities should think in-deep about the value of professional collection management. It is an old hat that preventive conservation and professional storage saves costs in the long run. Cutting budgets here might result in higher costs later. As a society: politics, communities and tax-payers in general should think about the value of museums and their collections. We all know that a person that loses his memory will lose himself. It’s the same with a society that loses its history. Preserving our heritage is not only a cost factor, it has high value for a society.